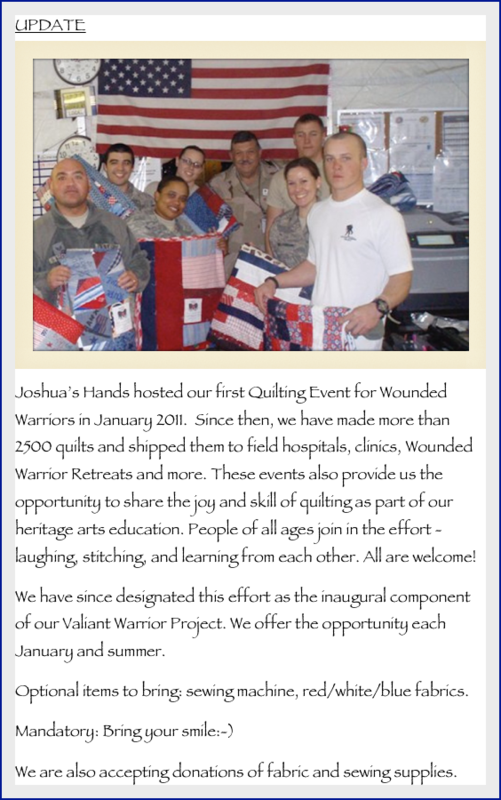 Joshua’s Hands hosted our first Quilting Event for Wounded Warriors in January 2011. Since then, we have made more than 1600 quilts and shipped them to field hospitals. These events also provide us the opportunity to share the joy and skill of quilting as part of our heritage arts education. People of all ages join in the effort - laughing, stitching, and learning from each other. All are welcome! We have since designated this effort as the inaugural component of our Valiant Warrior Project. We will offer the opportunity again each January and July/August. Optional items to bring: sewing machine, red/white/blue fabrics. We are also accepting donations of fabric and sewing supplies. To provide handmade quilts for servicemen and women wounded while serving our country. To share the joy of quilting and working together as a community in a mentoring environment. The Valiant Warrior name and all slogans and photos are copyrighted and trademarked materials.